Will it fit both 750ml and 1.5 liter bottles? BEST ANSWER: It will fit both. The 1.5L bottle will take up 2 spaces in the rack. It is ideally made for 750ml Bordeaux or Cabernet Sauvignon style bottles. If you put too many 750ml Pinot Noir style bottles togther they start to cram each others space and don't fit well. You almost have to alternate a Bordeaux bottle then a Pinot Noir bottle. The 750 ml bottles don't necessarily fit in the 13 slots across due to the different size of the bases. If you have some large base bottle you will probably loose about 2 slots. The 1.5's would take about 3 slots and they probably will not fit in the lower racks due to the space between layers. It will fit both sizes, but the 1.5 liter bottles fit better on the top row. It is a tight squeeze on the lower rows. You could probably fit a Magnum on this rack but it's really intended for standard Bordeaux bottles. I have many of these and they are great for 750 ml but not for larger formats. I can't fit them on the bottom shelf but they fit on the top shelf. top rack holds both sizes, lower racks only hold 750 ml. Is this product available in other finishes or would I need to buy it in Natural and finish it myself? I am particularly interested in Espresso or Black Satin finish, or maybe Walnut. BEST ANSWER: Yes, this product is available in Walnut as shown, Natural, and Mahogany finish. This product is available in walnut,mahogany & natural finish. Could I safely stack 5 or 6 of these kits on top of each other? BEST ANSWER: Thank you for your inquiry. The tallest I would stack would be no more than 3 kits tall. Any more than that I would consider anchoring or securing to the wall. If you have any further questions, please feel free to reach out to us at 800 356 8466. Thank you again. These units are stackable vertically with wall support and the included support brackets and should be anchored to a wall as you increase height. I have a 47 inch opening that I would like to hang this rack from. Do the pieces of wood ship unassembled so I can trim a 1/4 inch from the ends? It does ship unassembled. However we cannot guarantee if you modify the rack that it will maintain it's structural integrity. Modifying the rack will void the warranty. BEST ANSWER: Yes, you could use them in different locations! what is the wood used in the (Natural) wine rack? 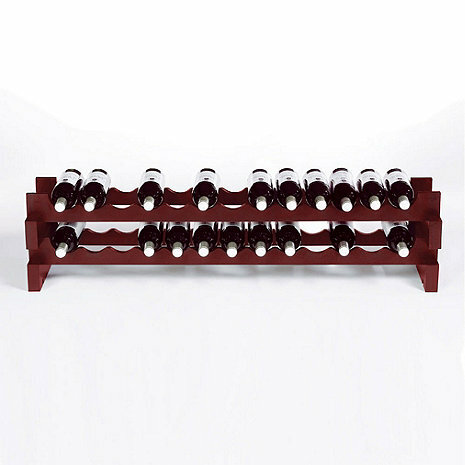 what is the largest bottle diameter that will fit in this wine rack? how high can I stack these racks before needing a wall support? BEST ANSWER: Thank you for your inquiry. Our 26 bottle stackables use Mahogany wood and can accomodate up to a Burgundy sized bottle. Regarding how tall one can stack, If you were to stack more that one, I would definately anchor to the wall. If you have any other questions, please feel free to contact a storage specialist at 800.377.3330. Thank you again. please tell me if there is any finish on this rack - will it accept Min-Wax stains? thanks. BEST ANSWER: The natural option does not have any finish and should be able to accept Min-Wax stains. BEST ANSWER: Hello BB, thank you for your question. The dimensions of this rack put together are 11-1/4" in height, 47-1/4" in width, and 12" in depth. Looks good, strong, and holds bottles well including Pinto Noir. I bought 5 racks capable of holding 130 bottles of wine. Some of the dowel holes were missing and had to be drilled. The dowel rods themself were not very sturdy. When stacking the racks, with little side to side movement numerous dowel rods broke. This required me to drill both parts to get the dowel out. After I actually got them all put together they looked great. What seemed like an easy assembly turned into a headache due to the flimsy dowels. They need to upgrade the wood for the dowels or put in some extras to make up for breakage. I wrote the company to let them know about the problem in the hope they would correct the problems with quality control for the next person to purchase the rack. I bought 3 racks for my husband for Christmas. Overall they are very nice. However, the pre-drilled holes were not straight so he had to do some additional work to get them to fit correctly. Luckily he's pretty handy at that kind of stuff. I bought four of these to stack and have them in a closet. I was worried about how sturdy they would be, especially stacked and they worked out great. I love the fact that there were two sizes to choose from and this one was perfect, so maximizes our storage. If I didn't have a closet, I think these would look nice enough to use in a kitchen or bar area. There are a few bottles that have to spread out, but they all fit on the rack. I would buy this great wine rack again! I put this on a counter of the wet bar and it fits easily under cabinets in space that otherwise would not be used. It attractively displays more than two cases of wine -- I have a mixed selection of reds whose labels are easily readable. The wine in this rack can move to the table anytime or can continue to mature right in the rack. Product was easy to assemble and provides tremendous storage for our wine. We actually put the unit in a closet and it works well. I have a small wine cellar, fewer than 100 bottles at present. This expandable wine rack is attractive in my basement and serves its purpose very well. Unless I hit the lottery I'll never have a separate formally-constructed wine cellar so these racks work extremely well for me. Assembly is very easy. Very easy to assemble and looks great. Some of the bottles slip down a little bit so that they aren't tilted as far forward as I would like, but most of them fit well. I'd like to stack up more but I'm not sure how sturdy it would be. Overall, it looks great and works great for a very reasonable price! Stores big quantity in small space. I bought 2 racks, there are extra wooden pegs included so they can be stacked. The only negative on this purchase is it does not hold larger diameter bottles as well. They must be spread out causing the capacity of the rack to be lower. Items were delivered on time. They were easy to assemble and look good. Bought three sets and glad I did! Best value among all racks that I researched. The only complaint I have is that my Pinot bottles do not fit as well as my regular Bordeaux/Napa Cab bottles. But overall, it's just fine. The product was easy to assemble and appears as pictured. If it had a little more height it could accommodate 1.75L bottles.